Just found a new couple of vids on Youtube from someone who has only been uploading for a couple of months. Basically, these two vids can sate a serious Routemaster/Metro/Titan fix! Have to say I rather enjoyed those videos. Lots of interest in both of them. I'm not a great Routemaster fan but those videos brought back happy memories of faster bus journeys and those workhorses doing their thing. Also good to see the rare single ex WMT single door Titan on the 3 and T1000 with the old flip dot destination display. - Oxford St NOT being a red bus wall at all. - funny to see so much car traffic in the centre of town. How things have changed since then. - how vehicle presentation changed between old LT and the private companies. In the first video many of the RMs look battered and vandalised. They look so much better in the second video. 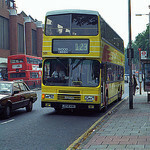 I've linked one of the Routemasters in Croydon videos, there are others available, from the the 80's. By then it was just the 68 and 109 with memories of buses in North End and people forming orderly queues at bus stops. And still shots in Croydon from the 60's and 70's including the old West Croydon bus station. Being an old Hither Greenite, it was wonderful to see so many 36s going there. I see what you mean about Arthur Daley, but a comic actress who did live very near there was Rita Webb: she used to hang out of a window conversing with local people, very 'in character'. My time on the 28s/31s was after I'd left LT and gone to work for Camden Council, with much time spent around the Adelaide Road, then socialising in West Kensington, so a quick change was made from a 31 to a 28 at either Kilburn or Kenny High Street. Actually, I was amazed to see all those 31s going through to Camden Town: when it was worked by Battersea and Chalk Farm, it seemed a matter of honour to Battersea's drivers to get turned at Swiss Cottage, if not Belsize Road. The 28 at least performed to stereotype, X drivers not liking to go south of the river! Nice memories, though, of how simple it was just to jump on or off a bus, and it speeding away. Why've we complicated everything so much? Some more nice footage from the same era, mainly Routemasters on the 31. Interesting to see a 36 in X garage; in those days a Harrow Road, Prince of Wales short turn meant a visit to Westbourne Park for the crew. Adelaide Road as I remember it; no yellow lines until almost Chalk Farm station! Also, the two northbound 31s on Camden High Street, one off en route to Chelsea, the other on the offside evidently on a garage trip to HT. RMLs about to be replaced by midibuses. A real slice of history - 31s everywhere, now you get one every 10 minutes if you're lucky. Not an Uber in sight, no solid traffic jams, no way near as many push bikes. Lots of fumes, throaty engines and Upton Park showing off their lovely RMC’s which graced the 15. The first vid brings back memories of the RM with original AEC engines. They sounded like scary monsters back then, they still do, lol. What a disgraceful video. All those off peak buses running around carrying no passengers. Should be taken out of service and parked in the garage. Bizarre to think that was 1985 and the RM was about to vanish from Barking and we fast forward 33 years and the place is full of NB4Ls. Who'd have bet on that? Better still, extend the REAL Routemasters on the 15 to Canning Town, and throw in the pretend ones as well. Actually, if you got every surviving RTW working you might just get an Aldgate to Canning Town service out of them, if we're going to totally enter the realms of fantasy. Now those were buses! Nah, let’s just cover the place with proper OMO vehicles, particularly L’s, M’s & T’s - now were talking lool. A confession - seeing this film, it was shot around the time I last visited the Barking/Becontree Heath area. It confirmed my impression about the 5, then. Every time a westbound 5 came along from Becontree Heath it was joined by a short working from Barking tagging along behind. Just see how often that happened! Strange selection of destinations, too. Waterloo, Old Street or Plaistow Greengate (not garage journeys to WH either, as these were Upton Park buses). Very strange scheduling! I always thought the T, many examples of which featured here, was a fine bus. I never liked the M, and I never got to travel in sufficient Ls to form a true opinion. I have to say I had much the same reaction. You could see there was not much attempt at regulation on route 5. It's not as if any of the buses in shot were exactly overloaded with passengers. Certainly reminded me of my experience, as a newbie to London, of London's buses in the 1980s. Feast or famine on too many routes. I thought the Titan was a very good bus and had no issues with the Metrobus either. Both decently competent for London work once LT had worked out how to look after them.